CLEVELAND -- LeBron James scored 26 points, grabbed five rebounds and dished four assists to lead the Cleveland Cavaliers to an easy 108-94 triumph over Central Division rivals the Chicago Bulls on Monday night at the Quicken Loans Arena. James made 12 of 23 shots, but the key was that he got plenty of help. Kyrie Irving finished with 18 points and 12 assists while Kevin Love tallied 16 points and 12 boards despite missing 10 of shots. Timfoey Mozgov had a solid 15 markers and 15 rebounds and J.R. Smith lit up for 20. After taking a slim 24-19 margin at the end of the opening quarter, the Cavs blew the game wide open by outscoring the Bulls 60-43 in the second and third quarters. Cleveland made 41 of 90 shots and won the rebounding battle, 54-40. Jimmy Butler led the Bulls with 20 points and Derrick Rose recorded 18 points. But the Bulls shot just 30 of 80 from the field while their offense sputtered with only 12 assists against Cleveland's 20 dimes. Despite the loss, the Bulls remain on top of the Central Division with a 27-16 slate. But the Cavaliers are closing in at 22-20. 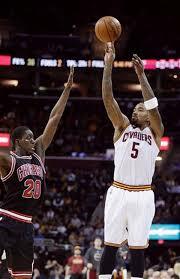 Photo: J.R. Smith (R) contributed 20 key points in the Cavs' 108-94 rout of the Chicago Bulls on Monday night at the Q Arena.